Once you’ve determined that staying fit during your senior years is a concept you want to wholeheartedly embrace, the next step is to find an exercise program that best fits your needs and goals. To help you find the senior exercise program that’s best for you, Home Care Assistance, a leading provider of Toronto senior care, offers some valuable tips to keep in mind. You don’t necessarily have to settle for a facility that’s exclusively for seniors, especially if you prefer being around people of all ages. More and more fitness centres are offering programs that accommodate older patrons. If you’re a senior with certain health concerns (i.e., arthritis, recovering from recent surgery), ask your doctor for a recommendation on a program that’s likely to work best for you. Your doctor will also be able to advise on if you may need assistance from a family member or professional Toronto home caregiver when performing specific exercises for safety concerns. 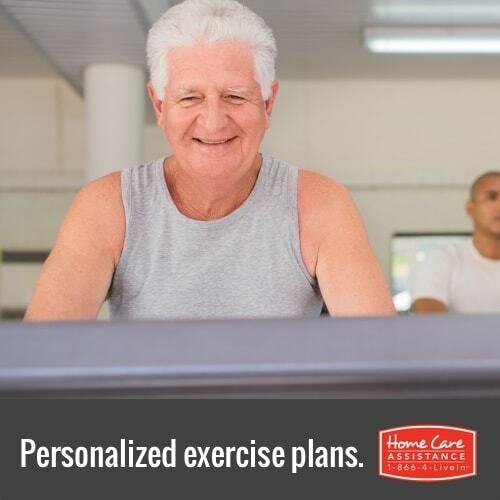 Some larger hospitals also offer senior exercise programs or sponsor local programs. There are plenty of online directories that can serve as an excellent starting point for finding senior exercise programs in your area. Do a little digging and read some online reviews for a particular program that you’re interested in to get a better idea of what’s good and what may not be all that great about each program before you commit. Interested in learning more about senior fitness? Reach out to Home Care Assistance of Toronto today. While we specialize in Toronto live-in care, we also provide care on an as-needed basis for seniors who need help with daily exercise, cooking meals, personal care, transportation and so much more. Call 416-488-8777 to request a complimentary, no-obligation consultation with a friendly Care Manager and find out the many benefits of in-home care for seniors.